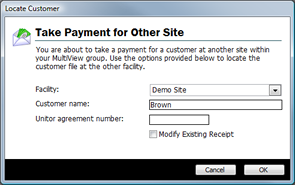 The take payment for other site function is used when one Central site wishes to take a payment for a Customer at another site within your group. For example, a Customer of Demo Storage Company's "Site A" happens to be driving past Demo Storage Company's "Site B"...so long as these sites use Storman Central, this Customer can simply walk into "Site B" (in fact, any other site connected to Central) and pay their "Site A" invoice. During the below process you will be taking a payment for another site. From the Central menu, select Take payment for other site. Select the facility and enter your search criteria in the window provided. If you wish to edit a existing receipt check the Modify Existing Receipt check box. 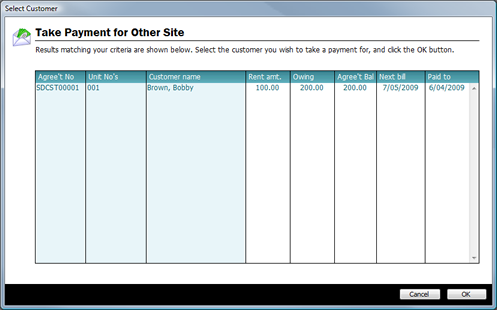 A payment window will appear, allowing you to take a payment for your selected Customer. The window will also show some information about the Customer (including the amount they owe) to assist you in ensuring the Customer pays the correct amount (where applicable). Click OK the complete the process.